Hindus have launched a last minute appeal to prevent the slaughter of a sacred bull which has tested positive for tuberculosis. The bull, Shambo, lives in a shrine in Llanpumsaint, Carmarthenshire. 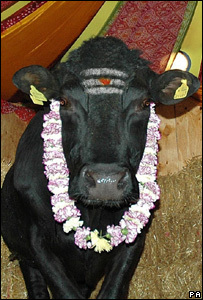 Officials at the Skanda Vale Temple and the Hindu Forum of Britain, say the killing of cows and bulls is against their religious principles. But the Welsh assembly government said infected animals were slaughtered to "protect both human and animal health". Shambo tested positive in routine bovine TB screening and was placed in isolation. Agriculture officials intend to start discussing whether to slaughter the six-year-old British Friesian on 14 May, but the temple is mounting a legal challenge and has begun an online petition to save Shambo. Ramesh Kallidai of the Hindu Forum of Britain, which represents many Hindus in the UK, said the rest of the herd of 35 cows and bulls were "absolutely fine". "As a responsible organisation, the temple has sought professional veterinary advice to ensure that robust measures are taken to isolate Shambo and minimise the spread of disease. "Killing Shambo will violate our faith, tradition and desecrate our temple. It goes against all accepted norms of our faith." Mr Kallidai added they would be calling on the Welsh assembly government to intervene. Skanda Vale Temple, known as the Community of the Many Names of God is a multi-denominational monastic centre, which embraces all religious faiths and includes three Hindu shrines. It attracts over 90,000 pilgrims every year and Skanda Vale also runs a hospice. Speaking on behalf of Hindus at the temple, Swami Suryananda said they "understand and appreciate" the position with regards to public health and containing the spread of bovine TB. "We have been advised that there is provision both within the Animal Health Act 1981 and the more recent TB Order Wales 2006 for permission to treat and vaccinate any animal identified as having TB with the prior consent of the minister for the National Assembly of Wales." But an assembly government spokesperson said TB was a disease which was transmissible to humans and other mammals. "We fully understand that this can be distressing for the owners, but these measures are in place to protect public health and animal health and prevent the further spread of the disease. "An animal kept by the Community of the Many Names of God has tested positive, and the case is being dealt with in the usual way. Every effort will be made to deal with this case as sensitively as possible."